Child Rights Awareness Creation Organisation (CRACO) – INCREDIBLE: Woman gives birth after 14 years pregnancy! 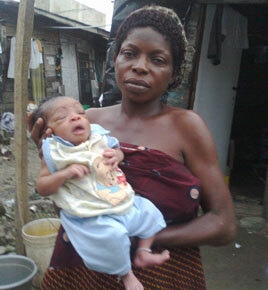 A woman – Mercy James miraculously gave birth to a baby girl after 14 years of being pregnant. The baby was promptly and aptly christined Miracle. And why not? If the mother had delivered at the expected time the child would have been a teenager by now and possibly in secondary school at the JSS 3 level. Mercy, a single parent, said of her ordeal during the 14 years she was pregnant but could not give birth: “When I first took in, I knew that I was pregnant with signs and test that confirmed that I was. Four months later, I went to hospital for another test, the result showed that I wasn’t pregnant, but had fibroid. Subsequently, I began to experience bleeding, at least once a day. Sometimes, my tummy would protrude in the semblance of pregnancy. I went to different hospitals, and I kept on receiving the same result that nothing was wrong with me. But deep down inside , I knew that all was not well with me. “So I was taken aback when a midwife told me I was pregnant. But considering the test which showed I had fibroid, I was angry with the midwife for giving me what I felt was a false prophecy of hope. Thereafter, I started going from one church to another and from one native doctor to the other. The results that I got from them all remained the same. I became more feeble and confused that I prayed for death to come. “I went again to the midwife two years after and complained to her about the pains that I was going through, she told me again that it was not fibroid but pregnancy; she advised me to be more prayerful so that God will deliver me from the hands of the devil. I kept on praying and at the same time asking myself that if truly I’m pregnant, why is it that the baby was not kicking? “I bought many concoctions that they said could cure fibroid and drank them. I even drank 12 bottles of a local cleanser but to no avail. This went on for years. Then God took pity on me and decided to wipe my tears. On the day I gave birth to my baby girl, I initially thought that worms were trying to come out of my body not knowing that it was a baby. This was what I told the midwife when we came to her. But after examining me she told me to push. I ignored her. I became unconscious for about 15 minutes and when I regained consciousness, I heard the cry of a baby. I was surprised and confused seeing my baby. I couldn’t believe my eyes. Hmm,I thank God for my life and that of my baby Miracle. I named her Miracle because she is truly a miraculous child”. The midwife at the Celestial Church of Christ, Kadoso Parish, Ajegunle where Mercy gave birth confirmed the development, especially the role she played. The woman who simply gave her name as Mrs Ajetima informed thus: “She was pregnant for 14 years and was unable to give birth during this period. Then on Saturday around 6:30am I saw two persons carrying her to this place. When she came inside, I laid her down and asked one of my daughters to examine her, after the examination, I found out that it was a baby that was about coming out and not worms. I asked her to push and she refused. My daughter gave her a hard slap on her laps since she refused to push. Behold a baby with placenta came out! I started shouting, calling on people to come and see for themselves that Mercy was truly pregnant, because if not, people will start to say that that Celestial woman has given Mercy a baby. Within a twinkle of an eye, the whole place was filled with people. God is wonderful”. Also affirming the happy development, Mercy’s closest friend, Odunayo Odeyemi had this to say: “I have known mercy for over nine years now. I met her with the pregnancy . In fact, she did not know that she was pregnant. I followed her to many places but her problems kept on increasing. Merely looking at Mercy then before she gave birth, you will notice that she wasn’t okay. I kept advising her to have faith in God because I had experienced the same thing. I was pregnant for three years and three months and God delivered me. On the father of Baby Miracle, Mercy informed that they got separated on account of the ordeal that attended her pregnancy. “Friday is the name of my baby’s father. Actually, we are not married. He just proposed to me and I became pregnant for him. He knew about the pregnancy. He always gave me money for tests and scans but he got tired and left me after waiting for me for over a year without seeing any sign of a baby. I have no option than to go my own way,” she informed.